Home / TallyERP.9 Lessons / How to manage Mutual Fund Accounting in Tally.ERP9? How to manage Mutual Fund Accounting in Tally.ERP9? 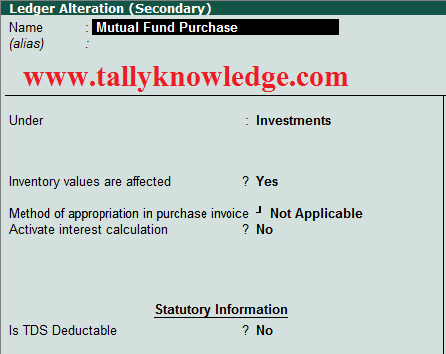 How to manage Mutual Fund in Tally.ERP9? 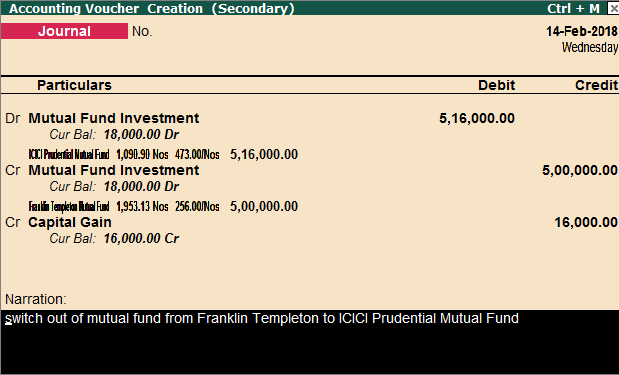 This is Franklin Templeton Mutual Fund, we need to create Ledger of Mutual Fund Purchase under Investment group. Suppose we purchase mutual fund from a broker for Rs. 2000 per month sip investment on market value price (see above image). In SIP there is monthly installment of mutual fund investment. To calculation unit wise value you need to setup inventory for Investment ledger. Create Broker Ledger under Sundry Creditors. Pass a Journal Entry. Note: If mutual fund purchase by Bank then you need to pass Direct Payment Entry. This entry create Stock Summary of your investment. It means your No. of Units and Price of purchase date. Same entry can be pass for next month SIP (Systematic Investment Plan). Now another entry is Lateral Shift Out. Suppose you have Investment of Rs. 500000 @ 256/- for total no. of units 1953.125 and this is shift to another mutual fund for Rs. 516000 @ 473/- for total no. of units 1090.90. In this case, your 1st mutual fund is switch to 2nd mutual fund with Rs. 16000 capital gain. If switch over more than 1 year it is long term capital gain otherwise short term capital gain. If you sold your mutual fund for more than cost then it will be your capital gain other wise capital loss. For Example, above illustration is transfer and you have 1090.90 units @ 473 per unit having balance 516000 and you sold the same for Rs. 580000 with increase of units and price as per market rate.